Filming on Gareth Edwards' reboot of classic Japanese monster movie Godzilla is well underway in Canada, and thanks to the current trend of dropping hints during film production through the use of social media, we've already had a few glimpses at footage and images straight from the set. Production company Legendary Pictures are being understandably secretive about most aspects of the plot, but to get the hype started, there have been a few promises made about what fans of the franchise can expect to see from this new version. The famous kaiju was last brought to the big screen in Roland Emmerich's 1998 remake, which made a lot of money at the box office but was poorly received by critics. With that in mind, Edwards - who made a name for himself himself with the ultra-low budget sci-fi thriller Monsters - seems like an excellent choice to reinvigorate the property. To tease monster movie fans about the current stage of Godzilla's production, Legendary Pictures has posted a mysterious new image from the set of the film to Facebook with the caption, "What's behind the radioactive containment doors?" What, indeed? Edwards has said in the past that the film will almost certainly contain scenes of Godzilla battling another monster, so perhaps the bunker is designed to hold some kind of weapon or means of killing the creature (like Serizawa's oxygen-destroying device). The warning signs on the giant steel door more or less guarantee that it has something to do with nefarious nuclear experimentation, and the ominous green lighting suggests that something quite dangerous might be behind the door (fun science fact: radioactive material usually does not glow, and when it does, it almost never glows green - that trope became popular during the first half of the twentieth century when the use of glow-in-the-dark radium-based paint in household products was common). Just Jared has also posted some new set photos of male leads Bryan Cranston and Aaron Taylor-Johnson in action (as well as over-sized overalls). 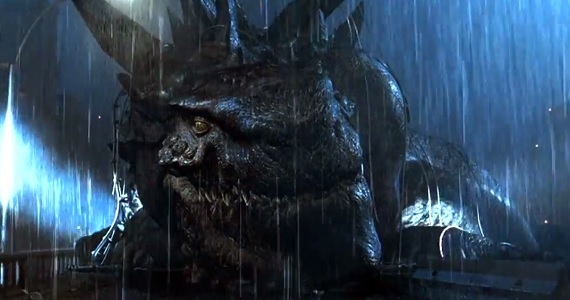 They appear to come from a scene where the two characters are investigating the destruction left behind in Godzilla's wake, though there are a few shots in which the two actors are shown cowering from something that is towering over them, which most likely means that the characters are getting a glimpse of the eponymous nuclear monster from the sea. If Edwards is, as he has said in the past, remaining quite faithful to the original movie, then these images are probably from an updated version of the scene when Professor Yamane and Emiko investigate the destruction of a small fishing village and encounter Godzilla for the first time. Legendary recently held a press conference to showcase some of their upcoming movies, and Coming Soon reports that part of the presentation was a recorded message from Edwards that dropped some new hints about Godzilla's plot and tone. He described the film as being highly relevant to today whilst also exploring the original themes of nuclear experimentation and fallout, and also summed up the story as mankind messing with Mother Nature, prompting Mother Nature to put mankind in its place. The classic origin story of Godzilla is that he is a dinosaur from the Jurassic period who lives out a peaceful existence in the ocean's depths until his natural habitat is disturbed by nuclear experiments. Today, Ishirō Honda's 1954 film is mainly remembered for its then-revolutionary special effects, but the film is actually quite grounded and realistic, using the appearance of the creature as a platform upon which to explore the contemporary fears of nuclear warfare and fragile international relations. Do you like what you've seen of the Godzilla reboot so far, and how do you think it will rate compared to Legendary Pictures' other modern kaiju movie, Pacific Rim? Let us know in the comments. Godzilla will emerge in theaters on May 16th, 2014.